Morning light, a glass of mimosa in hand in a country setting. We look forward to a delicious Sunday morning meal but not before we witness our courting couple’s wedding. In fact, Sunday brunch gives us a perfect opportunity to celebrate a marriage, whether in terms of wedding costs, Sundays being less busy, or in regards to the joyous ambiance under a radiant sun. We greet guests around 9:30 am, offering them either a kir, mimosa or the traditional champagne flute with strawberry. The ceremony, held on the charming site, takes place at 10 am and the party, starting with the brunch service, should ideally begin no later than 11:30 am. 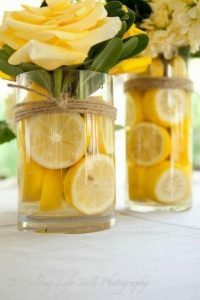 In addition to the welcome cocktail, a refreshment table with a variety of self-serve lemonades awaits, as well as a candy bar for the younger crowd or for those with a sweet tooth. Another fine addition might be a service selection of fine coffees, teas and herbal teas. Colours? Summery pastels with yellow, alongside white, taking precedence. 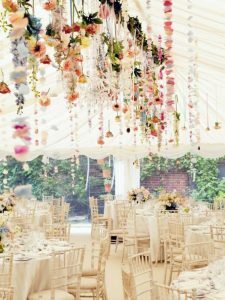 Centerpieces should be floral, whether delicate or majestic, the lighting being already taken care of by the brightness of the natural midday sun.